Talbot, William Henry Fox 1800-1800. 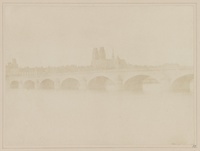 The Bridge of Orleans, Photographically illustrated book, ca. 1843-1845. Salted paper print from paper negative. Inv. Nr. 1994.197.2 New York, Metropolitan Museum of Art. Talbot, William Henry Fox 1800-1800. 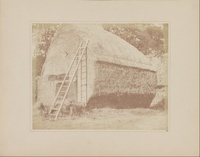 The Haystack, Photographically illustrated book, ca. 1841-1845. Salted paper print from paper negative. Inv. Nr. 1994.197.2 New York, Metropolitan Museum of Art. 作家名： ピーテル・ブリューゲル 1世 ( 1525年頃 - 1569年 ) タイトル：「激怒」七つの罪源(大罪）シリーズより 国籍： フランドル　ネーデルラント ジャンル： 初期ネーデルラント絵画　北方ルネサンス Bruegel, Pieter, the Elder 1525–1569. Anger (Ira), from the series The Seven Deadly Sins, Print, 1558. Engraving, 22.5 × 29.7 cm. Inv. Nr. 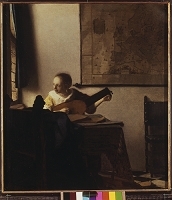 18.55.24 New York, Metropolitan Museum of Art. 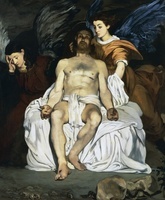 作家名： ポール・ゴーギャン ( 1848年 - 1903年 ) フランスの画家 ジャンル： 印象派　ポスト印象派 Artist： Paul Gauguin Location: Metropolitan Museum of Art, New York, USA Categories: Post-impressionismus Ia Orana Maria (I greet you, Maria). 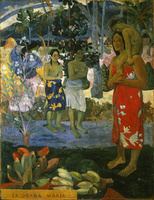 Landscape with yellow angel, praying women, Maria and Jesus as Tahitians. In foreground bowls with fruit. Oil on canvas, 1891-1892. 113,7 x 87,7 cm - Cat. W 428. Talbot, William Henry Fox 1800-1800. 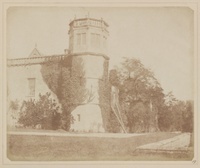 The Tower of Lacock Abbey, Photographically illustrated book, ca. 1844-1845. Salted paper print from paper negative. Inv. Nr. 1994.197.5 New York, Metropolitan Museum of Art. 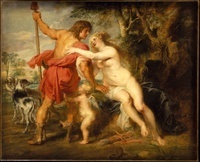 所蔵: メトロポリタン美術館 オランダの画家 ジャンル: バロック / 17世紀 / オランダ絵画黄金期 Study of a Young Woman, ca. 1665-1667. Found in the collection of the Metropolitan Museum of Art, New York. 所蔵: メトロポリタン美術館 Korin 1658–1716. Rough Waves, Folding screen, ca. 1694–1719. Edo period (1615–1868). Two-panel folding screen; ink, color, and gold leaf on paper, 146.5 × 165.4 cm. Inv. Nr. 26.117 New York, Metropolitan Museum of Art. Talbot, William Henry Fox 1800-1800. 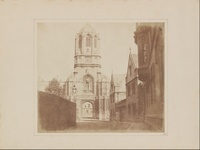 Entrance Gateway, Queen's College, Oxford, Photographically illustrated book, ca. 1843-1845. Salted paper print from paper negative. Inv. Nr. 1994.197.3 New York, Metropolitan Museum of Art. Talbot, William Henry Fox 1800-1800. 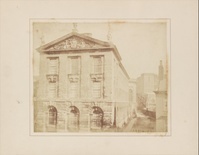 View of the Boulevards at Paris, Photographically illustrated book, ca. 1843-1844. Salted paper print from paper negative. Inv. Nr. 1994.197.1 New York, Metropolitan Museum of Art. Kempo happu shiki no zu|View of the Issuance of the Constitution/Baiju Kunitoshi 1847–1899. 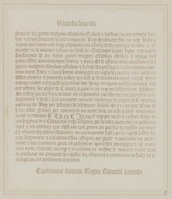 View of the Issuance of the Constitution, Print, 1889. Meiji period (1868–1912)./Triptych of polychrome woodblock prints; ink and color on paper, 36.8 × 72.7 cm./Inv. Nr. JP3384/New York, Metropolitan Museum of Art. Identifier : AKG5048426/Museum/New York, Metropolitan Museum of Art image date : 1.1.1889/Time Period/19TH CENTURY/2ND MILLENNIUM A.D.
Talbot, William Henry Fox 1800-1800. 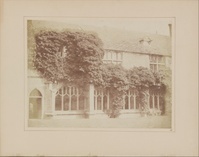 Part of Queens College, Oxford, Photographically illustrated book, ca. 1843-1844. Salted paper print from paper negative. Inv. Nr. 1994.197.1 New York, Metropolitan Museum of Art. Talbot, William Henry Fox 1800-1800. 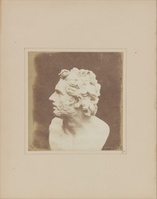 Bust of Patroclus, Photographically illustrated book, ca. 1843-1845. Salted paper print from paper negative. Inv. Nr. 1994.197.4 New York, Metropolitan Museum of Art. Illustration of the Ceremony Issuing the Constitution (Kenpo happu shiki no zu)/Yoshu (Hashimoto) Chikanobu 1838–1912. Illustration of the Ceremony Issuing the Constitution (Kenpo happu shiki no zu), Print, 1889. Meiji period (1868–1912)./Polychrome woodblock print; ink and color on paper, 36.8 × 75.2 cm./Inv. Nr. JP3240/New York, Metropolitan Museum of Art. Identifier : AKG5048356/Museum/New York, Metropolitan Museum of Art image date : 1.1.1889/Time Period/19TH CENTURY/2ND MILLENNIUM A.D.
Talbot, William Henry Fox 1800-1800. Hagar in the Desert, Photographically illustrated book, ca. 1843-1846. Salted paper print from paper negative. Inv. Nr. 1994.197.6 New York, Metropolitan Museum of Art. 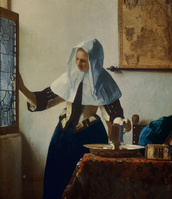 Allegory of Faith Vermeer, Jan (Johannes), called Vermeer van Delft; 1632–1675. "Allegory of Faith", c. 1671/74. 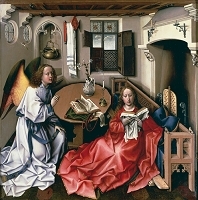 Oil on canvas, 114.3 × 88.9cm. 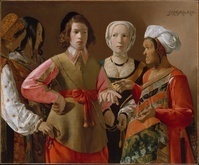 The Friedsam Collection, New York, Metropolitan Museum of Art. 所蔵: メトロポリタン美術館 Korin 1658-1716. Irises at Yatsuhashi (Eight Bridges), Folding screen, ca. 1710-1716. Edo period (1615-1868). 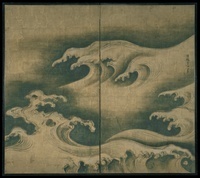 Pair of six-panel folding screens; ink and color on gold leaf on paper, 163.7 × 352.4 cm. Inv. Nr. 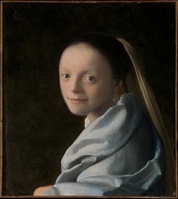 53.7.1, New York, Metropolitan Museum of Art. Thomas Eakins, 1844–1916. Die Schachspieler, Malerei, 1876. Öl auf Holz, 29,8 × 42,6 cm. Inv. Nr. 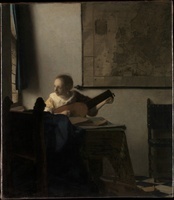 81.14 New York, Metropolitan Museum of Art. 作家名： ピーテル・ブリューゲル 1世 ( 1525年頃 - 1569年 ) タイトル：「激怒」七つの罪源(大罪）シリーズより 国籍： フランドル　ネーデルラント ジャンル： 初期ネーデルラント絵画　北方ルネサンス Bruegel, Pieter, the Elder 1525–1569. 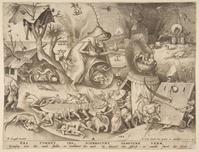 Anger (Ira) from The Seven Deadly Sins, Print, 1558. Engraving, 22.4 × 29.4 cm. Inv. Nr. 28.4 (31) New York, Metropolitan Museum of Art. Munch, Edvard 1863–1944. 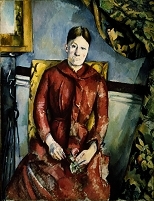 The Sin (Woman with Red Hair and Green Eyes), Print, 1902. 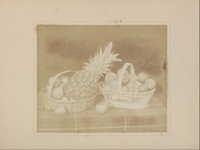 Lithograph printed in yellow, red and green, 69.5 × 40 cm. Inv. Nr. 1984.1167 New York, Metropolitan Museum of Art. Paxton, William McGregor 1869-1941. 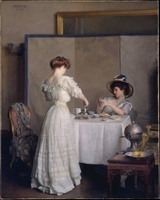 Tea Leaves, Painting, 1909. 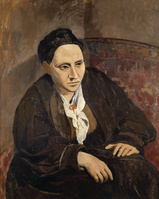 Oil on canvas, 91.6 × 71.9 cm. Inv. Nr. 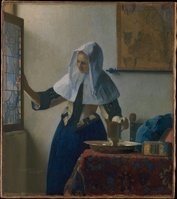 10.64.8 New York, Metropolitan Museum of Art. 作家名： ピーテル・ブリューゲル 1世 ( 1525年頃 - 1569年 ) タイトル：「錬金術師」 国籍： フランドル　ネーデルラント ジャンル： 初期ネーデルラント絵画　北方ルネサンス Bruegel, Pieter, the Elder 1525–1569. 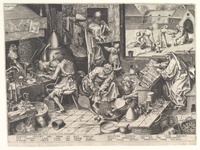 The Alchemist, Print, 1558. 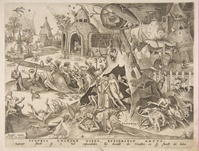 Engraving; first state of three, 33.5 × 44.9 cm. Inv. Nr. 26.72.29 New York, Metropolitan Museum of Art. Gérôme, Jean-Léon 1824-1904. 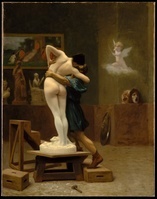 Pygmalion and Galatea, Painting, ca. 1885-1895. 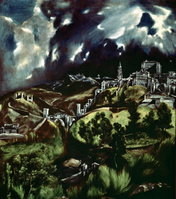 Oil on canvas, 88.9 × 68.6 cm. Inv. Nr. 27.200 New York, Metropolitan Museum of Art. Talbot, William Henry Fox 1800-1800. Lacock Abbey in Wiltshire, Photographically illustrated book, ca. 1840-1845. Salted paper print from paper negative. Inv. Nr. 1994.197.3 New York, Metropolitan Museum of Art. Talbot, William Henry Fox 1800-1800. 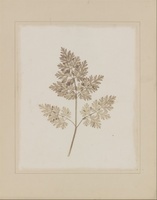 Leaf of a Plant, Photographically illustrated book, ca. 1843-1845. Salted paper print from paper negative. Inv. Nr. 1994.197.2 New York, Metropolitan Museum of Art. Talbot, William Henry Fox 1800-1800. 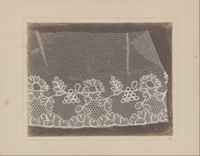 Lace, Photographically illustrated book, 1845. Salted paper print from paper negative. Inv. Nr. 1994.197.5 New York, Metropolitan Museum of Art. Talbot, William Henry Fox 1800-1800. Copy of a Lithographic Print, Photographically illustrated book, ca. 1843-1845. Salted paper print from paper negative. Inv. Nr. 1994.197.2 New York, Metropolitan Museum of Art. 作家名： エドガー・ドガ ( 1834年 - 1917年 ) タイトル：「女と菊の花（菊のある婦人像）」 国籍： フランス ジャンル： 印象派 Femme accoudee pres d'un vase de fleurs (Mme.Paul Valpincon), 1865 Canvas. 作家名： ポール・セザンヌ ( 1839年 - 1906年 ) タイトル：「エスタックから眺めたマルセイユ湾」 フランスの画家 ジャンル： 印象派　ポスト印象派 Artist： PAUL CEZANNE Title： Le Golfe de Marseille vu de L'Estaque Location： New York, Metropolitan Museum of Art Medium： PAINTING (TECHNIQUE); PAINTING (OBJECT); OIL ON CANVAS Date： 1885 Description： Cezanne, Paul 1839-1906. "Le Golfe de Marseille vu de L'Estaque" (The bay of Marseille, seen from L'Estaque), c. 1885. Oil on canvas, 73 × 100.4cm. 作家名：グスタフ・クリムト ( 1862年 - 1918年 ) タイトル：メーダ・プリマヴェージの肖像 国籍：オーストリア ジャンル　： 象徴主義　ウィーン分離派　アール・ヌーヴォー Gustav Klimt, Portrait of Mada Primavesi, 1912. Found in the collection of the Metropolitan Museum of Art, New York. 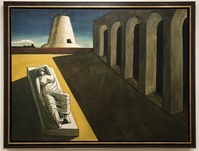 作家名： ジョルジョ・デ・キリコ ( 1888年 - 1978年 ） 国籍： イタリア ジャンル： シュルレアリスム Ariadne, 1913, by Giorgio de Chirico, Italian, born in Greece, 1888-1978, Oil and graphite on canvas, 53 3/8 x 71 in , 135 6 x 180 3 cm, Metropolitan Museum of Art, New York City. Image Code: X9Q-1407913. Photographer: Tomas Abad. Collection: age fotostock. Rights Managed. 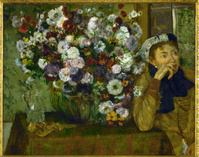 作家名： ジョルジュ・スーラ ( 1859年 - 1891年 ) タイトル： サーカスの客寄せ フランスの画家 所蔵： メトロポリタン美術館 （ アメリカ　ニューヨーク ） ジャンル： 印象派　新印象派 Artist： Georges-Pierre Seurat (December 2, 1859 - March 29, 1891) Title： Invitation to the Side Show (La Parade de Cirque) - 1887-88. Location： The Metropolitan Museum of Art, New York, USA. Invitation to the Side Show (La Parade de Cirque) - 1887-88. The Metropolitan Museum of Art, New York, USA. Georges-Pierre Seurat (December 2, 1859 - March 29, 1891) was the founder of Neoimpressionism. 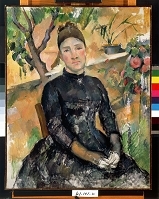 Seurat painted this particular work in six months during 1887-88 and showed the painting at the fourth exhibition of the Society of Independent Artists, in 1888. It was his first attempt to render the effects of artificial light at night using the Pointillist technique. Talbot, William Henry Fox 1800-1800. 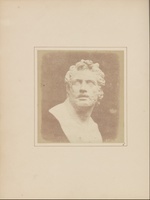 Bust of Patroclus, Photographically illustrated book, ca. 1842-1844. Salted paper print from paper negative. Inv. Nr. 1994.197.1 New York, Metropolitan Museum of Art. 作家名： ピーテル・ブリューゲル 1世 ( 1525年頃 - 1569年 ) タイトル：「傲慢」七つの罪源(大罪）シリーズより 国籍： フランドル　ネーデルラント ジャンル： 初期ネーデルラント絵画　北方ルネサンス Bruegel, Pieter, the Elder 1525–1569. 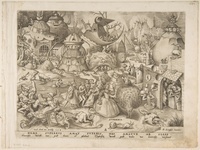 Pride (Superbia) from The Seven Deadly Sins, Print, 1558. 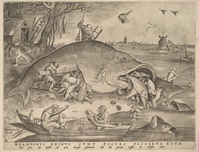 Engraving, 26 × 34.4 cm. Inv. Nr. 28.4 (39) New York, Metropolitan Museum of Art. 作家名： ピーテル・ブリューゲル 1世 ( 1525年頃 - 1569年 ) タイトル：「貪欲」七つの罪源(大罪）シリーズより 国籍： フランドル　ネーデルラント ジャンル： 初期ネーデルラント絵画　北方ルネサンス Bruegel, Pieter, the Elder 1525–1569. 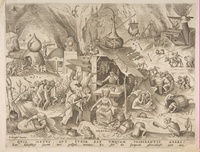 Avarice (Avaritia) from The Seven Deadly Sins, Print, 1558. 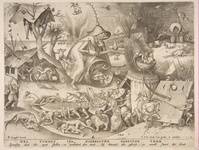 Engraving; first state of two, 25.9 × 33 cm. Inv. Nr. 28.4 (33) New York, Metropolitan Museum of Art. 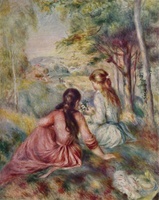 'In the Meadow', c1888. 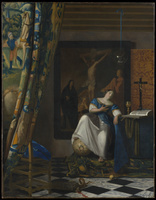 Painting held at The Metropolitan Museum of Art, New York. Talbot, William Henry Fox 1800-1800. The Open Door, Photographically illustrated book, ca. 1843-1844. Salted paper print from paper negative. Inv. Nr. 1994.197.2 New York, Metropolitan Museum of Art. 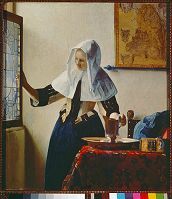 Vermeer, Jan (Johannes), gen. Vermeer van Delft; 1632–1675. 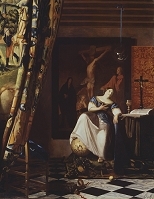 "Junge Frau mit Wasserkanne am Fenster", um 1664/65. Öl auf Leinwand, 45,7 × 40,6 cm. 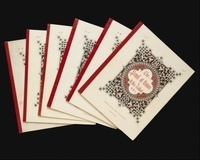 Marquand Collection. New York, Metropolitan Museum of Art. 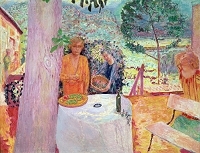 Munch, Edvard 1863–1944. 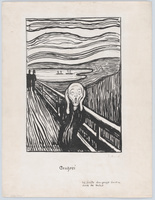 The Scream, Print, 1895. 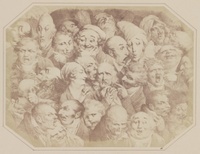 Lithograph, 35.7 × 23.6 cm. Inv. Nr. 1984.1203.1 New York, Metropolitan Museum of Art. Talbot, William Henry Fox 1800-1800. Facsimile of an Old Printed Page, Photographically illustrated book, ca. 1839-1845. Salted paper print from paper negative. Inv. Nr. 1994.197.2 New York, Metropolitan Museum of Art. Talbot, William Henry Fox 1800-1800. A Fruit Piece, Photographically illustrated book, ca. 1844-1846. Salted paper print from paper negative. Inv. Nr. 1994.197.6 New York, Metropolitan Museum of Art. Talbot, William Henry Fox 1800-1800. The Martyrs' Monument, Photographically illustrated book, ca. 1843-1845. Salted paper print from paper negative. Inv. Nr. 1994.197.5 New York, Metropolitan Museum of Art. Talbot, William Henry Fox 1800-1800. The Pencil of Nature, Photographically illustrated book, ca. 1844-1846. Salted paper prints from paper negatives. Inv. Nr. 1994.197.1-.6 New York, Metropolitan Museum of Art. Talbot, William Henry Fox 1800-1800. Cloisters of Lacock Abbey, Photographically illustrated book, ca. 1842-1845. Salted paper print from paper negative. Inv. Nr. 1994.197.4 New York, Metropolitan Museum of Art. 作家名： フィンセント・ファン・ゴッホ ( 1853年 - 1890年 ) タイトル：「子守唄（ゆりかごを揺らす女性）」 国籍： オランダ ジャンル　印象派　ポスト印象派 Gogh,Vincent van 1853–1890. 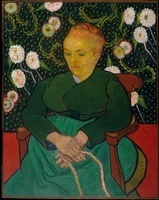 La Berceuse (Woman Rocking a Cradle; Augustine-Alix Pellicot Roulin, 1851–1930), Painting, 1889. 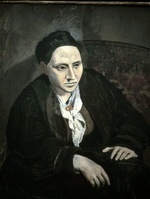 Oil on canvas, 92.7 × 73.7 cm. Inv. Nr. 1996.435 New York, Metropolitan Museum of Art. Talbot, William Henry Fox 1800-1800. 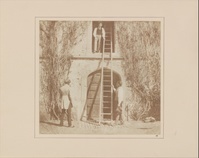 The Ladder, Photographically illustrated book, 1845. Salted paper print from paper negative. Inv. Nr. 1994.197.3 New York, Metropolitan Museum of Art. 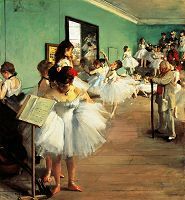 Thomas Eakins; 1844–1916. Der Denker: Porträt von Louis N. Kenton. Gemälde, 1900. 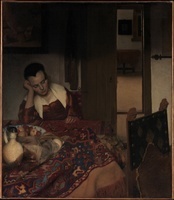 Öl auf Leinwand, 208,3 × 106,7 cm. Inv. Nr. 17.172 New York, Metropolitan Museum of Art. 作家名： ピーテル・ブリューゲル 1世 ( 1525年頃 - 1569年 ) タイトル：「貪欲」七つの罪源(大罪）シリーズより 国籍： フランドル　ネーデルラント ジャンル： 初期ネーデルラント絵画　北方ルネサンス Bruegel, Pieter, the Elder 1525–1569. 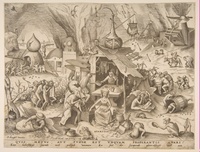 Avarice (Avaritia), from the series The Seven Deadly Sins, Print, 1558. 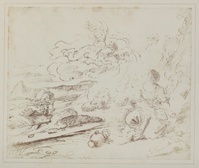 Engraving; first state of two, 22.5 × 29.7 cm. Inv. Nr. 18.55.21 New York, Metropolitan Museum of Art. Talbot, William Henry Fox 1800-1800. 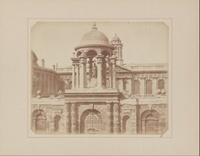 Gate of Christchurch, Photographically illustrated book, ca. 1844-1845. Salted paper print from paper negative. Inv. Nr. 1994.197.4 New York, Metropolitan Museum of Art. 作家名： ピーテル・ブリューゲル 1世 ( 1525年頃 - 1569年 ) タイトル：「邪淫」七つの罪源(大罪）シリーズより 国籍： フランドル　ネーデルラント ジャンル： 初期ネーデルラント絵画　北方ルネサンス Bruegel, Pieter, the Elder 1525–1569. Lust (Luxuria) from The Seven Deadly Sins, Print, 1558. Engraving, 22.6 × 29.7 cm. Inv. Nr. 28.4 (32) New York, Metropolitan Museum of Art.